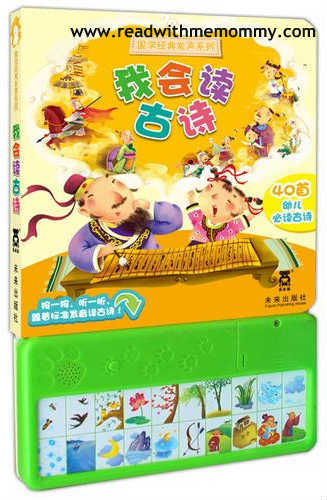 Sound Book - Ancient Poems is an interactive sound book is ideal for parents who are not able to read well in Chinese but would like to expose their child to the learning of ancient poems from young. This book contains a compilation of 40 ancient poems. Your child can learn famous poems, such as "静夜思", "七步诗", etc. Each page comes with the poems with accompanying hanyu pinyin. 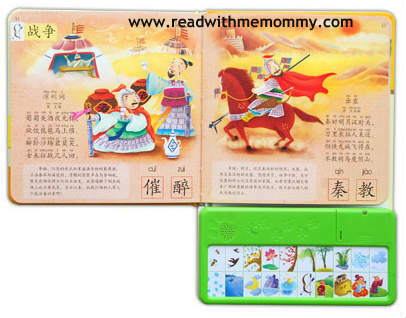 Parents who are not able to read to their child in Chinese can press the audio button. At the bottom of each page is a short description (in 3-4 sentences) in layman term to explain what the poem is about. This explanation section does not contain hanyu pinyin. This book is recommended for children who are 6 and above. SImplified Chinese and hanyu pinyin.